Whats more relaxing then painting? 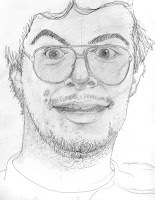 Good question... Well, how about painting iconic people from the 80's computing era! As I had to teach some art and design skills the other week, I needed to prep up some digital painting skills as its not something I've ever really looked into doing. He's a huge part of the 1980's computing era. 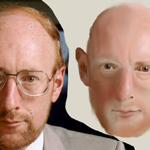 Sir Clive Sinclair - the man who invented the Sinclair ZX81 and ZX Spectrum. Amazing machines, which made a huge impact on the home computing market and helped forge the gaming industry as well. If you want to hear about just where it all fitted into the history of gaming, check out From bedrooms to billions. Its a great doco! This was done on a Sunday afternoon over a couple of hours - and I have to say just how much fun it was. Very relaxing, gradually building up layer-upon-layer (which sounds a tad like a Sarah Lee Cheesecake commercial) and softly smudging the colours together. I mostly work with Photoshop when it comes to making textures for spaceships, however I used MyPaint for this because of its more specialised brushes. MyPaint is a great opensource digital art program. What I like about it most is that its got a great brush engine. Loads of flexibility and ways in which you can get brushes to behave. Some change size based on velocity - which helps a lot if you find you have to work with a mouse (if you do, really, really consider getting a wacom tablet) yet want that more natural 'pen' stroke. Only real issue I have with MyPaint is that it can get quite laggy with high resolution work. These paintings were no problem - however after exporting the images I realised that I've painted them fairly low res unfortunately. Other than that I like that I can work full screen and operate it easily with a few easy to remember keyboard shortcuts (rather then rely on menus and tool bars). Plus it has an infinite canvas. 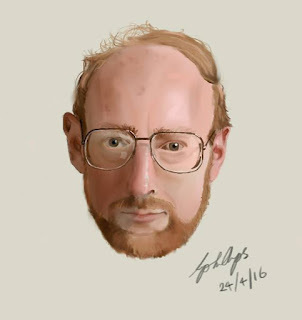 There are more great tools then MyPaint - I've toyed with a few others, and while I like them, I still find myself popping back to MyPaint... If you're interested in a few options, there is a very similiar tool called Krita. Krita is feature packed (a lot more then MyPaint), however it lacks an infinite canvas. The concept of infinite canvas is really appealing and feels a lot less restrictive. Note : I demonstrated Krita recently at a meetup I run each month, and it was fairly sluggish. The delay between drawing a stroke on my Wacom and the brush catching up was pretty bad and really didn't impress anybody who was watching the demo. Whether this was my PC (its a pretty hefty box with 32Gb, 256Gb SSD, core i7 and Quadro K4200) or the software, who knows... Its a free download - I'd be tempted to recommend downloading it for yourself and trying it. If its just doodling and sketching, then Mischief is an impressive tool. Its got a hybrid vector approach to artwork (you can zoom in and out without seeing pixels at all). It also has an infinite canvas and very fluid response (literally never gets laggy from what I've experienced). Its that fluidity that impresses me the most. Unlike the others, this is a commercial product. There's a very cool free version (minus the oh-so-useful layers). Its not as feature-packed as the others (basic sketching brushes mostly) but that's not a bad thing - it has the tools you need for drawing and removes the bloating which is likely why its so quick and clean to work with. But - lets get back on topic. 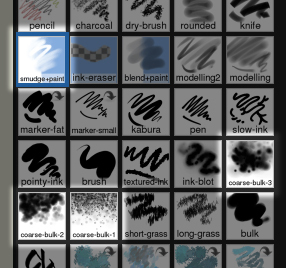 I found that MyPaint has a great brush called smudge+paint - it does exactly what it says... Based on the pressure of the stylus, it behaves very much like a chalk or soft pastels. Hard pressure paints a solid colour, lighter pressure smudges things. The general process blocking in areas of solid colour by pressing hard, then softly smudging them together couldn't be any easier. MyPaint has a large library of awesome brushes to choose from! There are also a large range of other brushes, though apart from smudge+paint, the only other brushes I needed were a splattering brush (course-bulk) which I mention later on and a simple pencil brush to sketch out the general illustration. 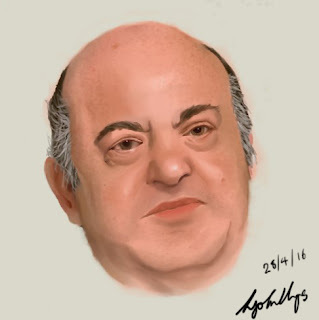 Jack Tramiel was the founder of Commodore computers, a company who also greatly impacted the 80's computing market with machines such as the Commodore 64, VIC20, PET and Amiga. Sadly he passed away in 2012, but of course his legacy still lives on. He was a little more challenging to paint - mostly due to all the folds and wrinkles in his skin - but I learnt a lot about painting detail and shading from doing it, so it was well worth the effort. In fact, I actually used that same brush to add the small amount of speckled skin marks on Sir Clives head as well. Like any piece of art, I could keep working on this - I realise that there were a lot of finer wrinkles on his skin such as the ones on his forehead, etc that I didn't put in. However I like the softer look of the painting, so I'm pretty happy with the result. Placing that in a layer of its own, the reference photo to one side, I added a layer below the sketch and I just started to block in the colours in large areas. The photo helped give me a guide to the colour tones I needed, and then it was down to a lot of painting and smudging to blend it into a final piece of artwork. Funnily I felt it always starts off looking rather 'bad' when you're just laying in the colours. Nothing feels more embarrassing then having people look over your shoulder early and see something that has the appeal of a painting made by a pre-schooler with blobs of colour that look flat and splattered on the screen. Once the key shades are in place that define the shapes in the sketch, I switch the sketch off and it becomes a hand painting process - observation of the reference and just painting in the lighting and tones by eye is really enjoyable. What I love so much about the process is that it helps get your creative side of the brain to take over, and then you start to really see what it is you're painting. It clicks, and you get that epiphany where it all makes sense. I've been considering keeping this 80's theme rolling and possibly including some of those unsung heroes who had an impact on the gaming industry back in the early 80's. Carol Shaw (who wrote River Raid for the Atari 2600) is said to be the first female game programmer (or at least one of the first). Dona Bailey who, along with Ed logg developed one of my arcade favorites, Centipede.